Life Candy: Earth Night: The November Edition. Earth Night: The November Edition. After many months of "When are we going to have Earth Night again?" from Mini, we finally had an Earth Night last night. 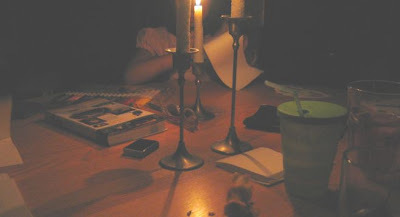 At 9pm, we turned off all electrical equipment (exceptions: fridge, water heater, and VCR that was taping Dr. Who), gathered at our round dinner table, candles a-blaze, and enjoyed a nice quiet hour together. Mini drew all sorts of pictures with the new markers I gave her that morning. Lam decided to practice his math skills on various sheets of paper. Roomie worked on fleshing out some ideas he wanted to write about. And I worked on new blog posts and my Christmas TO-DO list. As I mentioned, it was all Mini's idea. When I asked her why she loved Earth Night so much, she said it was because she likes the candles and drawing. Lam says he likes the dark, writing, and candles. Roomie and I both like the quiet and the fact that we are together as a family. Actually, it was so quiet, Roomie and I were dangerously close to falling asleep. Seriously. It was dark, warm, and cozy. Give me a pillow and I would've been toast. Next time, we'll start it a little earlier in the evening. Shouldn't be too hard with it getting dark here so early nowadays. All in all, good for us, good for the environment. Happy. How incredibly cool! Sounds like you created a really wonderful family tradition as well as being environmentally savvy. Love this idea and will have to try it soon! That's actually a really clever way of getting the whole family to huddle together. Smart!